The Bicycle Thief is a gem attributed to the Italian Neo-realist movement. The film shows the creative bankruptcy of today's filmmakers. The film is slender and poetic. It tells a story that has universal appeal and is sure to touch hearts of all who have suffered misfortune and misery in a treacherous world, even once in their lifetime. By the measure of that metric only, the film is applicable to all. The beauty of the film lies in the simplicity of its screenplay. It shows how simplicity can achieve greatness, save the obfuscations of most modern day crap. The screenplay is not charmingly witty, not philosophically deep, not characteristically complex, not contemplatively silent. It is intensely emotional (without overdoing it) and fiercely personal. The story is rather simple: in post-World War Two Rome, Italy, jobs are scarce, and Antonio Ricci finally gets a job offer, as a billboard sign man, posting billboards about town, after waiting for months in front of the downtown labor office. One catch, he needs a bicycle. He has one, but it’s at a pawnshop. His wife, Maria, sells their good bedsheets so Antonio can get back his bike. The job is apparently a good one, as other workers anxiously vie for the job. Antonio suddenly feels human and dignified again, wearing a uniform, and being able to make money. Yet, on his first day at work, while pasting posters, his bike is stolen by a young man. Antonio has the weekend to get the bicycle back, so he can report to work on Monday with it. He gets his acquaintance, Baiocco, a garbageman, to help him look for the bike the next morning, along with some of his pals in the garbage company. But it is to no avail, so they keep on searching, and Antonio and Bruno have a number of encounters, such as seeing the thief with an old man, whom they track down to a church, but the old con man gives Antonio the slip, by saying he wants some of the free soup the church is offering. They do get a tentative address of the thief, and eventually Antonio catches up with him, and forces him back to his apartment, where his mother and neighbors declare him a good boy, an innocent. The vile wolfpack mentality closes in, and the thief plays his false innocence to the hilt, like the true professional grifter he is- likely having sold the bike already to another pawnshop, as a policeman is powerless to do anything, after they search the thief’s apartment. Antonio and Bruno eventually end up outside a soccer match, where hundreds of bikes are parked. He sees one in an alleyway, and, in a scene that shows a human desperation and honesty that are too often overlooked in art, Antonio gives Bruno some money to take a trolley home, and decides to steal the bike in the alley. Of course, he almost falls as he tries to pedal away, and the bike’s owner raises alarums, and this man’s neighbors chase and quickly capture Antonio- who is now pilloried as a bicycle thief, and a low man. He is so ashamed and without that he cannot even say a word. He is totally humiliated- all his honesty, honor, and playing by the rules have forced him into doing something wrong, and Bruno, who stayed behind, witnesses his father’s capture, runs to him, and weeps. The old man, whose bike it was, decides not to press charges, possibly out of pity for Antonio’s humiliation in front of his son, and Antonio walks away with his son, both weeping, yet hand in hand, having been defeated inside and out. Reputedly, none of the film’s actors were professionals, at the time. Antonio comes across so realistically, and wholly believably. Bruno is magnificent. He is wisecracking, but not in the annoying way Hollywood smart aleck kids are. There are numerous scenes that pinpoint the director's keen eye for details and highlight his tendency to maintain a desired balance between personal loss and humor, which relieves the viewer. Many critics have concluded that in The Bicycle Thief De Sica has tried to show that good and evil are relative. But nothing can be farthest from the truth. For instance, we know, all along, that the young professional thief would likely be a con man regardless as all of his neighbors are cheats and liars, and even his mother lies for her clearly guilty son. De Sica wants us to remind that sometimes evil can be born not out of pure evil, greed, and compulsive characteristic flaws, but can be born of different circumstances like desperation and poverty, as with Antonio. 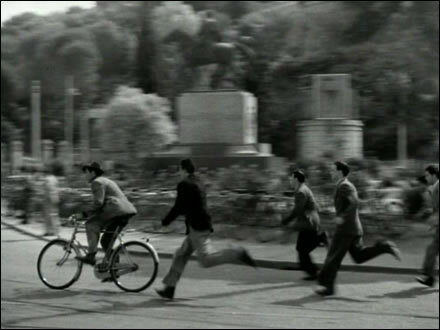 The Bicycle Thief is great art. 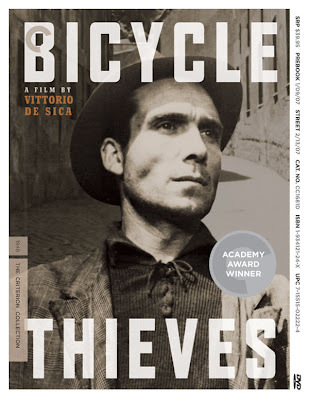 It is not a political manifesto as many critics have vehemently suggested.The Bicycle Thief tells a simple tale, but it documents the crushing of the human spirit at the hands of poverty, indifference and misery.